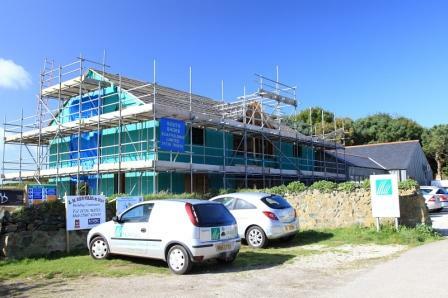 Work is well underway on Cornish Cottages’ new office building on the Mullion Meadows Craft Centre. The bespoke two story, timber clad building will be the new offices for the growing holiday letting agency. With a recent rebranding exercise and an increase in workforce, the company has outgrown its existing premises. Helston builders EH Reynolds started work on the build 2½ months ago, with Cornish Cottages anticipating moving in early next year. Truro-based communications company Bush Telegraph has won the contract to install the telecoms system, while Helston computer consultatant Kernow Tek, will be implementing the networking systems and bespoke booking program.